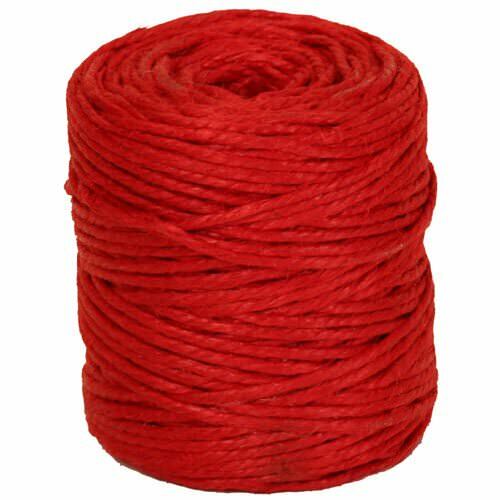 I am interested in purchasing approx 100 spools of the Red and White baker's twine. I see that it is currently out of stock. When will it be back in stock? Also, what sort of bulk pricing can you offer? I will need this product in October. You'll be feeling more than fine with our red twine! In fact, your decorations will be feeling as good as it gets. This red twisted ribbon will hold all of your items together and bring a little touch of passion into the mix. It's strong, durable, and will last you a long time. Red always brings some fire, and now, thanks to our ribbon, your arts & crafts will be flaming hot! Great for a simple touch on any kind of wrapping paper! Use the twine for Valentine's Day, anniversaries, birthday parties, or Christmas festivities. Or tie up your cookies and party favors together nicely. Whichever way you tie it, this twine will surely be the icing on the cake that you were looking for. Red Twisted Kraft Ribbon measures 25 yards. Red Twine measures 73 yards. Red & White Baker's Twine measures 500 yards or 109 yards.